Okay, everyone I talk to in a position to know (and happy to share with me) says that Captain America #600 and Reborn #1 will feature the return of Steve Rogers to the role of Captain America by some undisclosed (to me, at least) means. With the three-and-three-quarter inch Ultimate Captain America figures currently in the shops, you get a memo purporting to be from Reed Richards to Tony Stark. 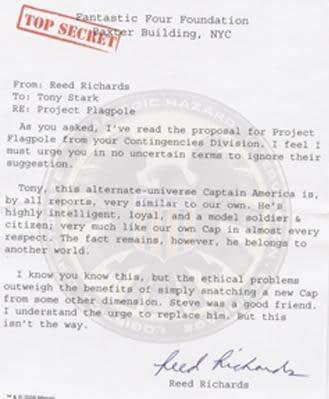 This memo lets us know that not only do certain members of the Marvel Universe know about the existence of the Ultimate Universe, but this may be a way to replace Steve Rogers in the Marvel Universe without getting icky over Steve Rogers’ slowly rotting body. Of course this is likely to be a red herring. And one that Richards pours scorn over. Mmm, Red herring, smothered in hot scorn! Tasty!